The cancellation of the first all-female EVA (extravehicular activity) – due to a change of program due to the non-immediate availability of two medium-sized spacesuits – raised a fuss of comments and sarcasm: the American space agency is able to dress two men for an extravehicular activity, but not two women? MODULAR PROTECTIONS. The suits for the Apollo astronauts were custom-tailored by the seamstresses and artisans of the International Latex Corporation (the same one that made Playtex bras). But when NASA had to focus on the next phase of space exploration, that of the Space Shuttle program, they opted for a more economical approach. With a space taxi available for trips to the “near” space, it was unthinkable to rely on custom suits. It was then decided to create individual pieces for arms, legs and busts that could be mixed. The extravehicular mobility units (EMU) were produced in five sizes: extra small, small, medium, large, extra-large. The engineers of the time thought that women could wear the same suits as men, at most in smaller sizes. But they did not take into account the differences in body shape: for the same height and weight, women may have wider hips and narrower shoulders, and if one part of the space suit must cover the hips and shoulders, likely an astronaut have to be settle with compromise. Peggy Whitson, a NASA astronaut who holds the record for female extravehicular activity knows this well: 10, in 665 days in Space (the American who spent the most time in orbit). “For a woman, taking space walks is more complicated, especially since the suits are larger than the average woman’s size,” he said in an interview. 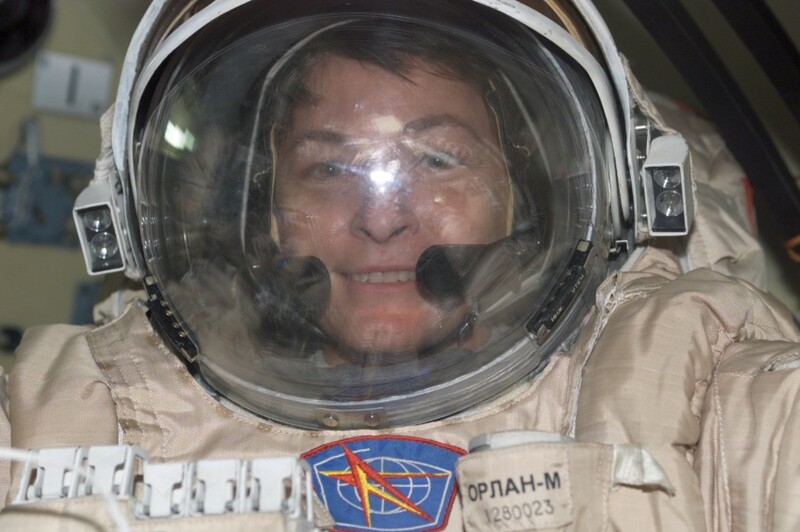 American astronaut Peggy Whitson performed her first EVA (extravehicular activity) in 2002, wearing a Russian Orlan suit (still used today by cosmonauts on the ISS). 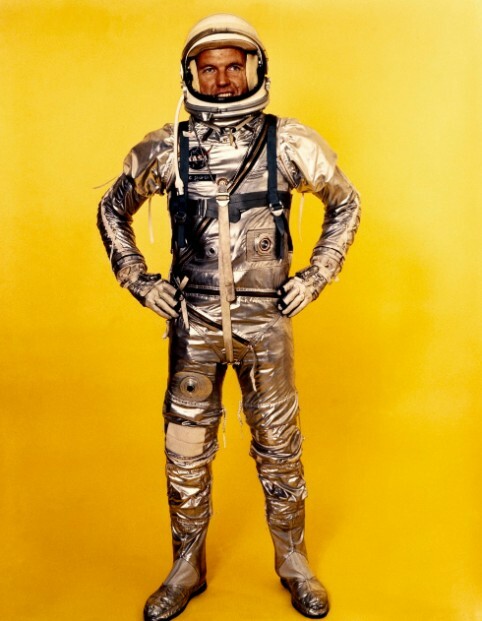 Gordon Cooper, one of the first 7 astronauts recruited by NASA in 1959, pose in his Mercury suit, the same one used in 1962 by John Glenn, the first American to go into orbit around the Earth. 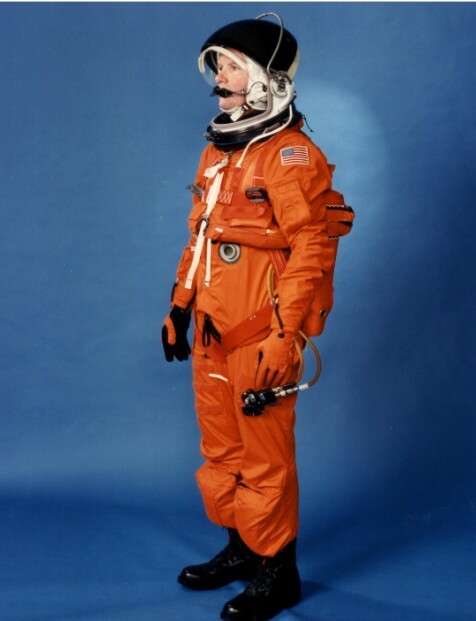 The Mercury suit was not a real space suit: it was actually a modified version of the Mark-IV pressurized flight suit, used by US navy pilots for high altitude flights. Designed to be comfortable for long periods of time – the astronauts of the time did not have the possibility to change themselves on board – it was equipped with the main survival systems: it provided its “inhabitant” with oxygen for breathing but also pressure in case of depresurization of the cabin. However, this clothing did not allow any type of extra vehicular activity such as spacewalks. After the first flights and the first landings it was equipped with floats that allowed the pilot to leave the cockpit in case of post-return problems. Since 1963, NASA has adopted the Gemini suits, the first real spacesuits. Made from a pressurized suit for high altitude flight, it could be used inside and outside the spacecraft. 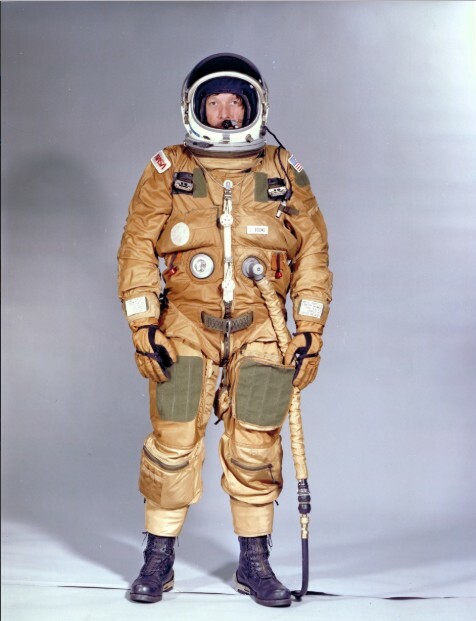 It was composed of 8 layers of nylon and nomex, a fireproof material, to which, during operations outside the vehicle, an additional “coat” could be superimposed resistant to cosmic dust, radiation and micrometeorites. On Earth it weighed about 18 kg. 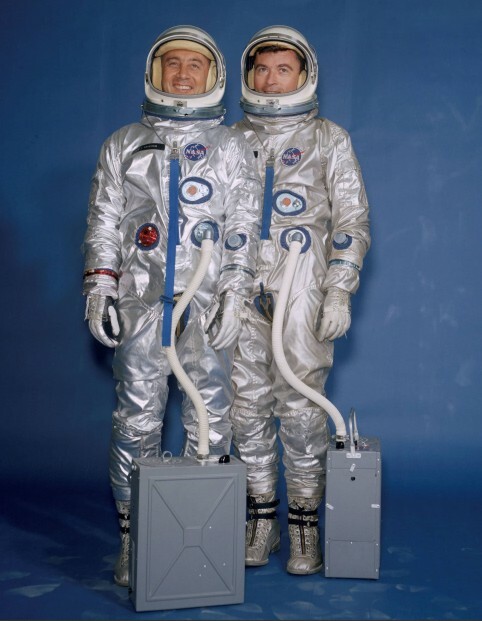 In the photo: Gus Grissom and John Young in their Gemini suits connected to a portable air conditioning system, essential to guarantee occupants a comfortable temperature. On 3 June 1965 the Gemini suit, equipped with the outer protective layer, served as a personal spaceship for Ed White when he left the Gemini IV capsule for the first spacewalk. The “Michelin little man” effect is given by the pressurization system that inflates the suit. With the start of the Apollo missions the space suit changes radically: it must offer astronauts protection from the lunar environment, with temperatures ranging between 120 ° C at midday and 170 ° C at sunset, it must be able to be worn for long periods of time up to 8 hours and must allow to move easily and guide the rover on the surface of the satellite. 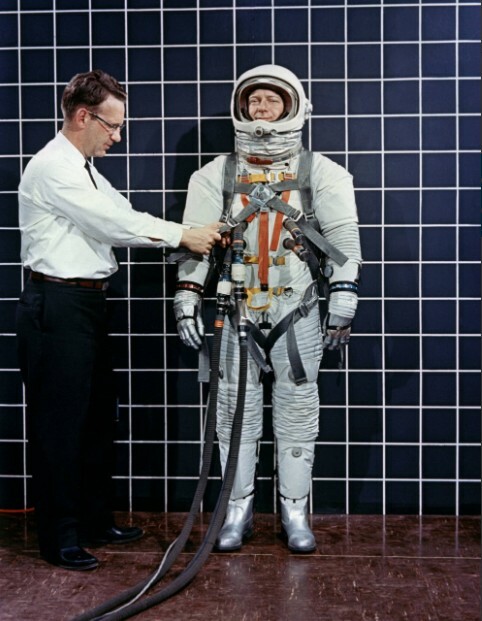 Thus the A7L suit was born, much more flexible than the previous ones, even if pressurized. It is the first suit to which an external survival system (air conditioning, respiration and pressurization) can be attached that does not make the “umbilical” connection with the spacecraft necessary. The critical element of the Apollo suit is the gloves: less thick than the other parts of the device to allow the astronauts to handle tools and collect samples, they must however be resistant to wear and cuts that could create problems of depressurization. On 12 April 1981 the first flight of the Space Shuttle program took off. John Young and Robert Crippe, the two protagonists of that historic mission, leave for space wearing a new concept suit, much more similar to that of the pilots of combat aircraft. At the time, the Shuttle had seats that could be moved so that the crew, made up of only two people, could leave the aircraft in case of emergency during take-off or return. This suit allowed the expulsion from the Shuttle to be dealt with up to the speed of Mach 2.7 and from a height of 24,000 meters. Currently the crews of the Shuttle wear the Advanced Crew Escape Suit, called “the pumpkin” for its color. It is used during take-off and landing to ensure the integrity of the crew. In addition to having breathing and pressurization systems, it is equipped with a parachute that in case of emergency allows the astronauts to leave the aircraft from the safety porthole, a life preserver and the most modern communication and location systems. On the front panel of the suit are positioned all the controls and knobs that allow the control of the various devices. The white color of the suit is used to make astronauts visible in the darkness of space and to reflect sunlight. 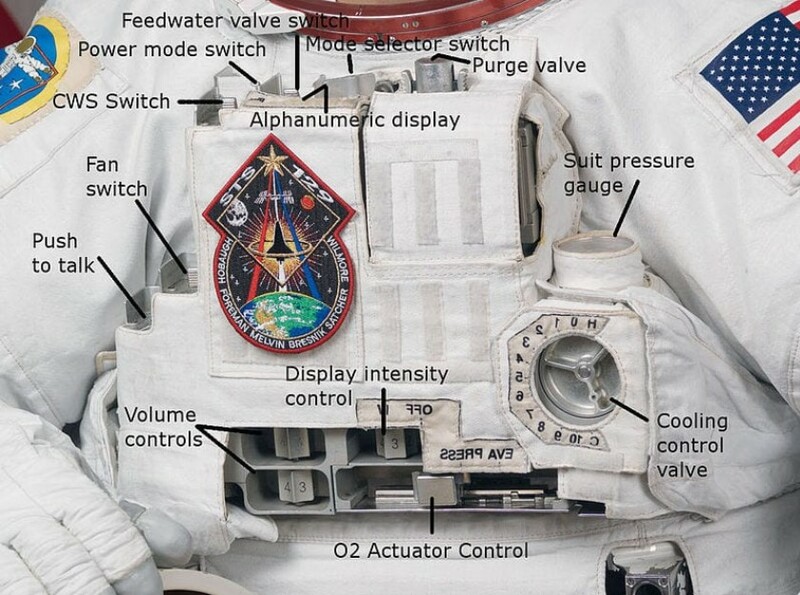 The writing on the panel is upside down because the astronaut, to find the right command, reads them through a mirror attached to his wrist. The future of space suits will be foucused on materials: the goal of the researchers is to develop devices that can leave the astronaut with more mobility, especially on the joints and hands. The current suits in fact, especially those destined to spacewalks and outdoor use, once pressurized become so thick and rigid as to make the movement of the fingers difficult. And then there is the problem of weight, on Mars an extravehicular suit like those used today on the ISS would weigh over 43 kg: a little too much even for the most trained physicists. 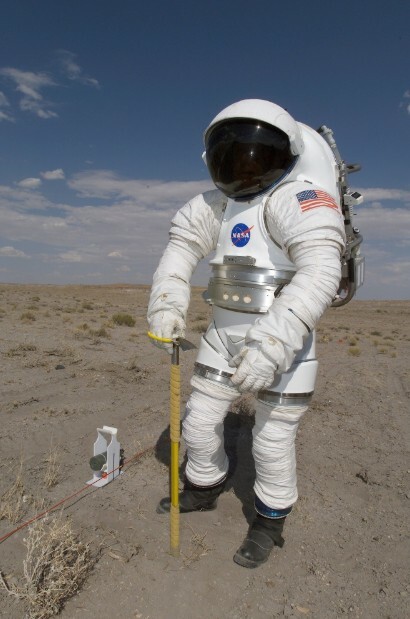 Among the models that NASA is testing there is the Mark III suit (pictured): designed specifically for the return to the moon and for the exploration of Mars, it is not worn but it is entered through a rear opening. Unlike those used on the Moon by Apollo crews, this allows you to bend your knees, for example to collect samples, and has an autonomy of 150 hours. Future astronauts could also be much more … fashion: large and formless pressurized coveralls will be replaced, to make way for much more comfortable and technological design garments. 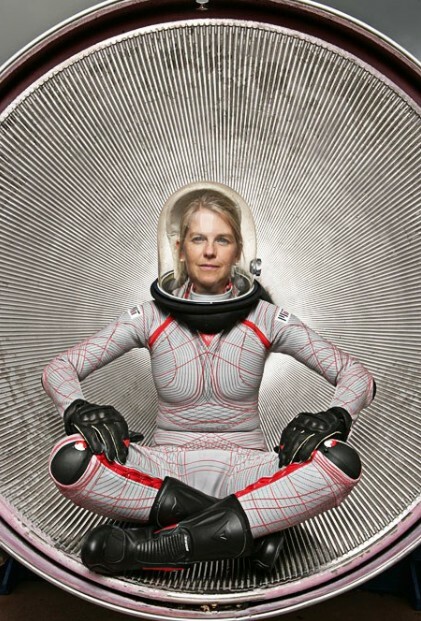 Dava Newman, a researcher at MIT, has been working for a few years on the Bio Suit, a new concept suit able to maintain constant body pressure in the vacuum of space, using mechanical counterpressure method instead of pumps: BioSuit , presses directly on the astronaut’s skin. This extraordinary result is achieved thanks to an intelligent fabric that unites the inextensible points of the body, that is the point whose relative position never changes even when one moves. The result is a high-tech garment, light and resistant, which frees the astronaut from a good part of the weight of the equipment necessary for survival. The project is still in its initial phase: the prototype of the photo above is made of lycra, absolutely unsuitable for protecting the body from radiation and chemical agents. Understanding how to adapt it to high-tech fabric layers will still require numerous studies. NARROW WARDROBE. 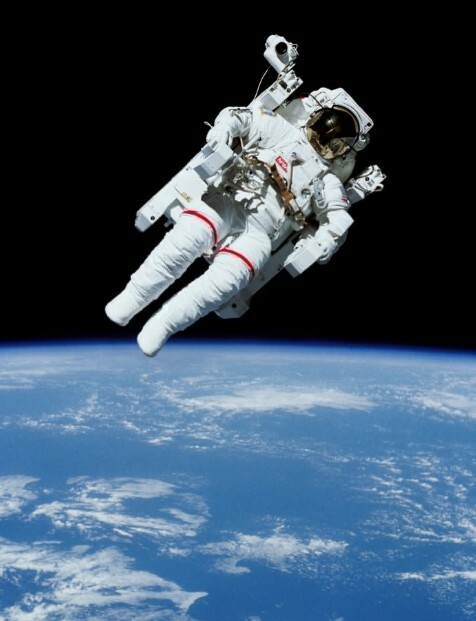 In the 1990s, the reduction of NASA’s budget led to the first reductionin the production of space suits: the extra small was the first size to be eliminated, and shortly afterwards the small one was also. Most physicists were within the M and L: Nasa decided to have focused on those. The consequences of this change began to emerge in 2011, after the end of the Shuttle era: the EVAs were reserved for some astronauts on the spacecraft, instead on the ISS everyone must be able to conduct extravehicular activity. NICE CV. BUT IT FITS? The size of the astronauts came to influence the possibility of being selected: “Those who applied were to be bigger, to be chosen,” says Bonnie Dunbar, a former NASA astronaut, five times on the Shuttle. A similar situation, but “on the contrary”, had occurred in the 1960s, when the small size of the Apollo capsules required the choice of astronauts no higher than 1,80 m.
Today’s NASA astronauts still use overalls designed 40 years ago. In recent years almost 200 million dollars (177 million euros) have been spent in designing new ones, but uncertainty about future space exploration projects does not help: a suit to go to the moon is different from one to colonize Mars. 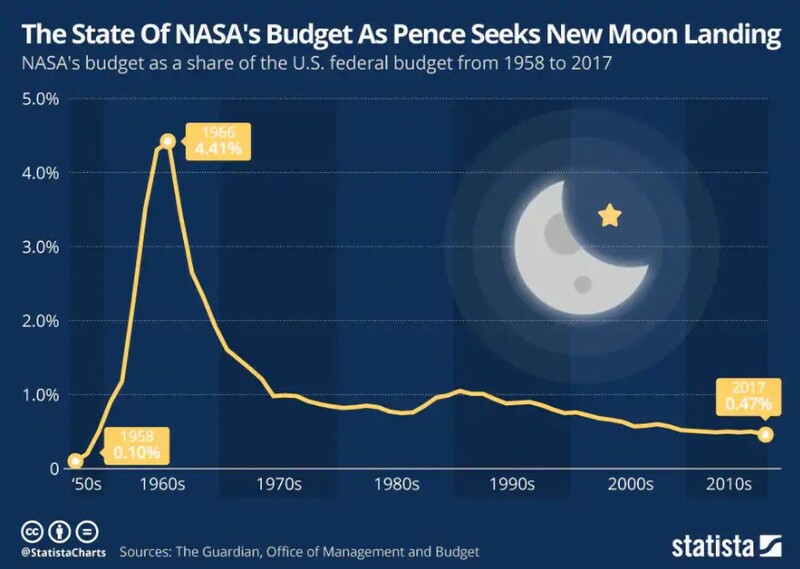 The NASA budget from 1958 to 2017, expressed as a percentage of the US federal budget. SEXISM? NOT TODAY. On the issue of Christina Koch and Anne McClain has had a severe impact the time when astronaut women were rare (NASA premiere, Sally Ride, flew in 1983). Moreover, the body in orbit changes in ways that cannot be perfectly simulated in the training phase: a fact that affects the fit of the space suits and that can force the program to change for safety reasons. 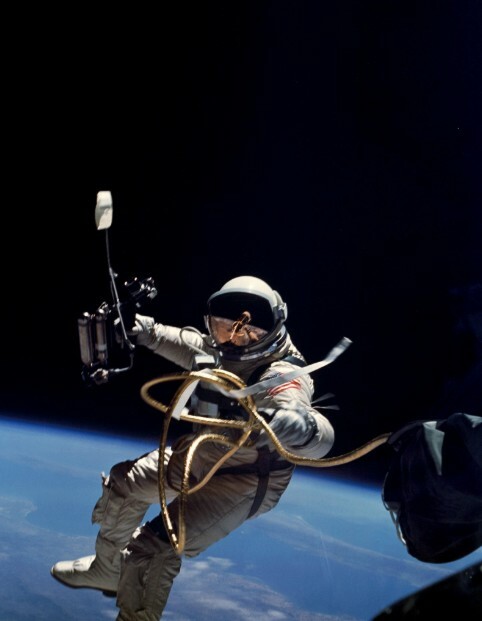 This entry was posted in News and tagged activity, EVA, extravehicular, history, measures, Nasa, Space, Suits. Bookmark the permalink.